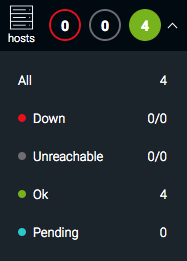 If all servers are connected to the Centreon Central server. If the data transfer process has latency. By clicking on the pollers icon you will be able to view the various issues and directly access the server configuration menu. This part presents a summary of the status of the hosts monitored by the platform. Only statuses not acknowledged or not in downtime are displayed. You will be able to visualize the total number of monitored hosts and their distributions by status. By clicking on each status (Down, Unreachable, Up, Pending) you will access directly to the Monitoring > Status Details > Hosts menu filtered. This part presents a summary of the status of the services monitored by the platform. You will be able to visualize the total number of monitored services and their distributions by status. 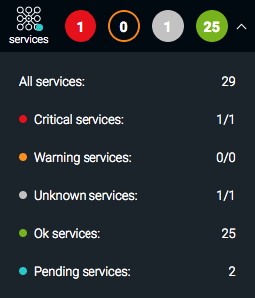 By clicking on each status (Critical, Warning, Unknown, OK, Pending) you will access directly to the Monitoring > Status Details > Services menu filtered. This last part displays the time according to the timezone selected in your profile and allows you to edit your profile by clicking on the icon. 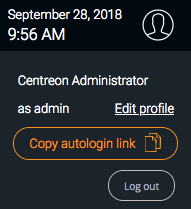 You can also copy the direct connection url (autologin), and log out of the Centreon interface.